A recent report prepared by the Amazonian Geo-referenced Socio-Environmental Information Network (RAISG) and InfoAmazonia, in coordination with eight other Latin American institutions, published a map that shows more than 2,000 data points across the Amazon where illegal activity is occurring. This includes illegal mining and logging in 96 protected areas. Most of the illegal activity is taking place in Venezuela where there are a reported 1,899 data points documenting illegal mining or logging. Venezuela is followed by Brazil where 321 cases of illegal activity are recorded. In Ecuador, the number drops to 68, and in Peru, 24. For organizations, governments, or advocates looking to protect the Amazon, this digital tool seems like a blessing. Yet, based on my experience it’s unclear whether these information-streamlining tools are actually limiting illegal activity. Before explaining my skepticism, I want to share some different types of digital tools currently being employed to help protect the Amazon. With the proliferation of satellite imagery services, we now have access to high-definition images that can provide an almost real-time picture of change in land use at a resolution of up to 30 meters. The National Institute of Spaces Research (INPE) in Brazil and the National Program for Forest Conservation for the Mitigation of Climate Change in Peru, are two initiatives that demonstrate how the use of satellite imagery, remote sensing, and spatial analysis can alert authorities where illegal mining is occurring. 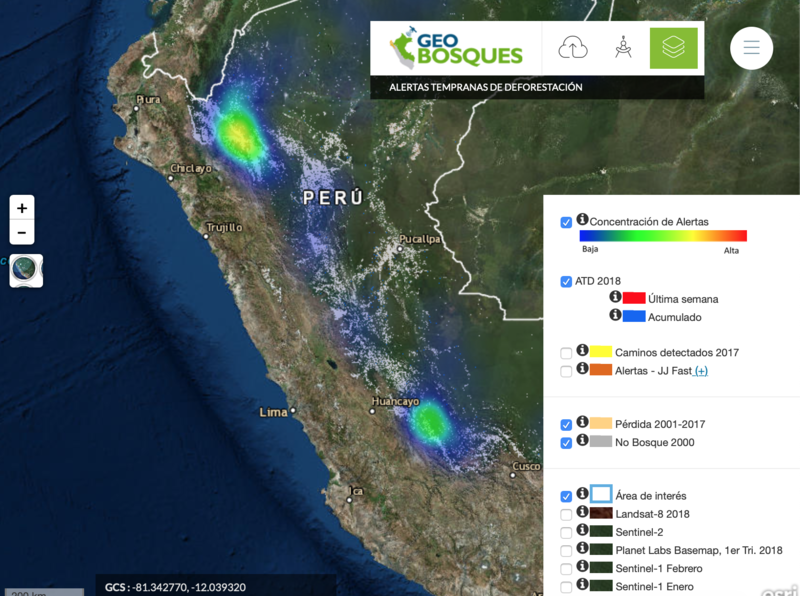 GeoBosques, provides an alert system in areas that could be deforested. According to conversations I’ve had with the authorities in Peru, the tool is quite useful, because it provides nearly real-time alerts of where illegal activity is occurring. Nevertheless, it also became clear that authorities tasked with monitoring illegal activity lack the resources to react to the information. In addition, the required political procedures that need to be followed before responding to an alert of illegal activity further limit the ability of authorities to respond quickly. That said, initiatives such as the Association for the Conservation of the Amazon Account (ACCA) with their Monitoring of the Andean Amazon Project (MAAP), which collects data from five different satellites, continues to raise awareness across the Amazon region of trends in illegal activity by country. For example, according to the project’s latest report, the principal drivers causing deforestation include gold mining, palm oil, cacao, small-scale agriculture, cattle pasture, logging, roads, and dam construction. This type of information is critical to informing governments and activists and can help develop future initiatives to protect the Amazon. Drones have revolutionized the use of aerial photographs and maps for civil society. Companies such as Terra-i have promoted the use of drones to validate satellite information. For instance, imagery from Landsat 7 satellite only provides an image with resolution of 30 meters, meaning it’s hard to confirm what exactly is occurring within an image and where. Drones can capture images at closer distances, and therefore can help confirm whether illegal activity is occurring in the area photographed by a satellite. The most common drone models used for these types of activities are the eBee or the Phantom 4. The eBee, for example, can only fly a maximum distance of 150 kilometers roundtrip. The Phantom 4 can only cover a distance of 33 kilometers roundtrip. These limitations are due to their battery life, meaning that deploying a drone to validate satellite imagery is most useful in areas close to a monitoring facility. As a result, it may be harder to validate satellite imagery in locations further from an operation center. Another drawback for initiatives looking to deploy drones is cost. A Phantom 4 costs $2,160 and an eBee is around $27,000. Purchasing either model is no small investment. That said, the benefit of using drone technology to help validate whether illegal activity is occurring in protected areas of the Amazon is clear. The question is whether investing in a drone will then lead to concrete steps by authorities to prevent future illegal activity. Mobile and web applications are also critical to helping combat illegal mining or logging throughout the Amazon. For instance, tools such as the Spatial Monitoring and Reporting Tool (SMART), used in Colombia, help record data from Amazon deforestation monitoring tours in real-time. This helps improve the management of protected areas. The SMART toolkit is based on open source software, and is therefore a great tool to consider using if you’re looking for the best way to provide medium- to long-term support to a project. 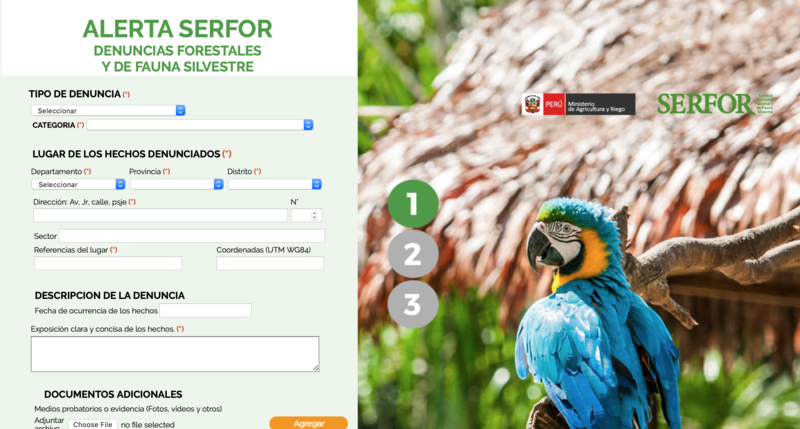 In Peru, the Forest Service (SERFOR) encourages people to use a web-based application called “Alerta SERFOR.” Alerta SERFOR allows any citizen to report illegal activity causing harm to the Amazon’s wildlife or fauna directly to authorities. Alerta SERFOR is a web app publicly available to report. 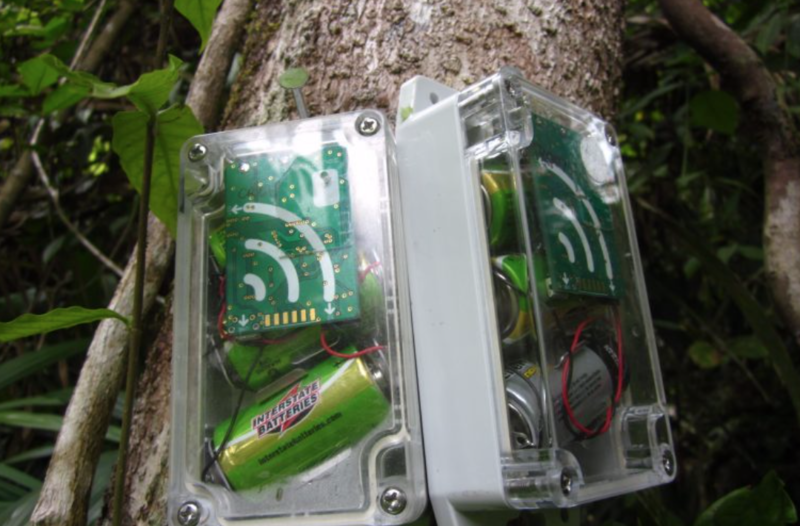 Acoustic monitoring devices are another tool used to monitor the presence of species, biological corridors, and illegal logging. The Open Acoustic Devices research group developed the AudioMoth, which monitors anthropogenic disturbances based on changes in acoustics. Devices such as the AudioMoth can help authorities identify where the illegal activity is taking place. Additionally, this type of technology is relatively cheap. On average it costs about $43, making it attractive to projects with limited budgets. AudioMoth, a small hardware that identify anthropogenic sounds in the forest. So far in this blog, I’ve reviewed four specific digital tools used to combat illegal logging and mining in the Amazon. Although each holds great promise in helping authorities protect the Amazon, using technology alone is never the only answer to solving environmental challenges. There needs to be continuous political will from South American countries to invest in addressing the issue. Together with more resources, these tech-based tools can make headway into preventing illegal logging and mining from going unchecked. I’d encourage all parties to focus simultaneously on building sustainable digital tools, while advocating for political support for these initiatives. Building for sustainability: To build digital tools for sustainability, they must be interoperable. Interoperability is defined as the capacity of a system or systems that can work with other existing or future systems, without restriction of access or implementation. By standardizing spatial data through the creation of Spatial Data Infrastructure (SDI), interoperability between digital tools becomes possible, because the spatial data collected will all be coded in the same format. This is actually how the interactive RAISG map operates. The map receives data from multiple regional SDIs, and plots the data on the interactive map. As a result, a more comprehensive picture of the activities occurring in the Amazon can be created and examined. Interoperability, therefore offers an opportunity to make geospatial data easy to combine with other data resources, making it more useful to Amazon protection authorities. The impact of data standardization and interoperability is not limited to geospatial data, rather these principles should be practiced whenever designing a digital tool. Advocating Political Support: In Latin American countries there are dozens of organizations working to protect the Amazon, therefore inter-institutional coordination is critical. Knowledge sharing of which tools are being used in different countries or by different organizations is a starting point. Nevertheless, without institutionalizing this coordination, knowledge sharing may become a secondary priority overtime. Therefore, what is truly needed is an articulation of principles or practices that all organizations or institutions will employ to address illegal logging and mining across the Amazon. Without legal support, these organizations will have little authority to implement any initiative. Digital tools that collect data on illegal activities occurring in the Amazon can help build an evidence-base to demonstrate why political, legal and financial support is needed. This will help not only protect the Amazon, but also help hold accountable those conducting the illegal activity.